Light in Babylon: "Hinech Yafa"
Barcelona Gipsy Klezmer Orchestra: "Shalom Alechem"
Joe Lansdale's first anthology apparently only saw one edition, unless there was a book club version identical in all but pricetag to this Double-D "trade" edition, and that's a shame, much in the same way as Doubleday's misspelling of Neal Barrett, Jr.'s surname on the dust jacket; as with Neglected Visions, the Barry Malzberg et al. reprint anthology I reviewed here some months back, this is a book that was tossed off casually (at best; "contemptuously" is the word Barry used for D-day's treatment of their "genre" lines at the time), despite being one of the best books I've read so far, if not the best, with reviewing for this "Forgotten Books" roundelay in mind. See the uninspired package slapped on the cover to the left, here. Brian Garfield, the recently late Ardath Mayhar, Jeff Banks, Lenore Carroll (with a very funny, literally peachy, sexually-charged culinary encounter), Thomas Sullivan, Neal Barrett, Jr., Lee Schultz (with a short, touching poem), William F. Nolan (with a teleplay for a pilot film for an unsold series), and Loren D. Estleman provide westerns from the traditional historical period, even if Barrett's pushes the late edge of that era, being set after the turn of the century (and bringing together Pat Garrett and some less likely historical figures; Lansdale suggests that only Barrett could write such a story, at least write it well...E. L. Doctorow has certainly tried, hard, and been given a lot more credit as well as money for doing less well; Doctorow definitely wouldn't've included the unobtrusive Bugs Bunny reference). Chad Oliver and John Keefauver offer contemporary stories with strong elements of fantasy in them, Keefauver's unsurprisingly a tall tale in a mode a shade more restrictive and neatly tucked-in than R. A. Laffterty or Howard Waldrop might produce; Oliver's, also unsurprisingly, draws on his anthropology background. LoLo Westrich, Elmer Kelton and Gary Paulsen give us contemporary westerns, Kelton's particularly a reminder that the economic recessions of the current day aren't any newer than this anthology, certainly, more than a quarter-century old now. I wasn't surprised this was a good book, but I was surprised that it was even better than an old favorite of mine, Razored Saddles, which has in comparison seen several editions and become a bit of a touchstone. I read this one years ago. A very impressive book, despite the packaging. 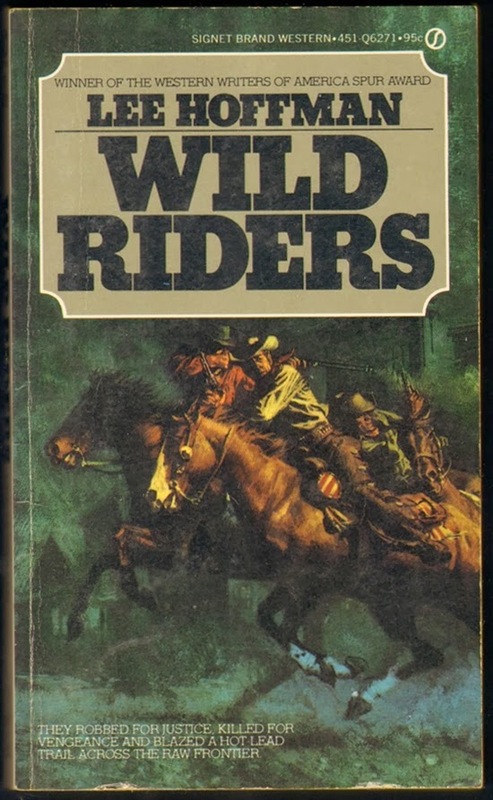 Given that I've had copies of RAZORED SADDLES and DARK AT HEART for years (RS for decades), it's odd that I hadn't sought this one out earlier...and it really should've seen more editions than it has, and a lot more attention. I'm hunting down BEST OF THE WEST after reading your review, Todd. Excellent choice! Thanks, George...I certainly won't be ashamed to have urged you on. "Night of the Cougar" sounds pretty exciting. It's good work, as Mayhar's western fiction has been in my experience. I rather wondered why the protagonist didn't have better armament at her disposal, but that might well've ended the story rather quicker. I looked through my western section to see if I had this anthology but that turned out to be a hopeless task. Too many damn books, I say, and I guess I have to agree with She Who Must Be Obeyed. Despite having just agreed I have too many books, I just went on amazon.com and ordered a copy for one cent plus postage. I guess I am crazy for books, mutter, mutter. 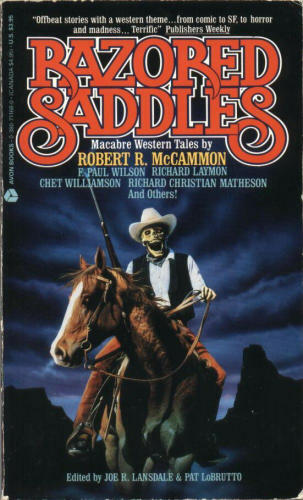 Razored Saddles (with Patrick LoBrutto) (Avon 0-380-71168-0, Oct ’90 [Sep ’90], $3.95, 285pp, pb, cover by Lee MacLeod) Reprint (Dark Harvest 1989) original anthology of 17 Western horror and fantasy stories. Razored Saddles ed. Joe R. Lansdale & Patrick LoBrutto (Dark Harvest 0-913165-49-2, Sep ’89 [Aug ’89], $19.95, 268pp, hc) Original anthology of 17 western horror and fantasy stories, illustrated by Rick Araluce. A slipcased deluxe limited edition of 600 copies signed by the editors and contributors ($59.00) is also available. -punk. Cyberpunk, splatterpunk, steampunk, Paul Di Filippo was hoping to stir up some ribofunk, but that didn't have the Right Extender. Joe Lansdale, rather an unwilling occasional resident of the splatterpunk drawer, actually the best of the writers who at least moved in that colloquial, at least sometimes extremely graphic, and irreverent direction, published his second western anthology in a year, after the slightly more conventional The New Frontier (Doubleday), in collaboration with Doubleday editor LoBrutto...the first of what has since been at least a small handful of western/horror crossover original anthologies. The Avon paperback is actually tagged, on its spine, "cowpunk"...a term that hasn't ever fully caught on (at least in literary circles...in music, where "splatterpunk" also made some inroads, it gained greater currency). 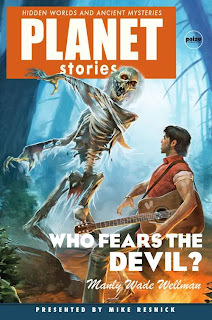 And, of course, when one assembles an eclectic mix of writers for an inherently eclectic anthology concept, you get some diversity in results...and a large portion of these stories aren't supernatural horror, though many of those without fantasticated elements are suspense or at least crime stories. One of the most memorable, "Eldon's Penitente" by Lenore Carroll, isn't even quite that so much as psychological study of the protagonist, and the morose burden he carries. Lansdale's own "The Job" involves two pieces of what John D. MacDonald liked to refer to as Mean Furniture, one of them an Elvis impersonator, out on a hit...I have to wonder if this story was an ancestor of "Bubba Ho-Tep" when the Elvis as Action Man nudge wouldn't leave JRL alone. Neal Barrett, Jr's "Tony Red Dog" is a contemporary western crime story about the title character, rather sharper than Lansdale's killers, who needs to extricated himself from hit contract as the target, and is perhaps the best single story in the collection. The worst is certainly the Chet Williamson, which, like Scott Cupp's mildly diverting piece, attempts to get Big Laffs out of homosexuality in the Old West...while the Cupp makes the Alamo into a haven for homosexual liberation arrayed against the repression of Santa Anna, the Williamson posits an illustrator who is an utterly incredibly self-deluding gay man as the target of horrible abuse by two hulking monsters. But, doncha know, them gay bo's is Different. Not That different...this story has been inexplicably praised in some quarters. Howard Waldrop and David Schow are among those who provide the kind of story one might almost expect of them, as does Lewis Shiner with an historical piece with a pointed sociological agenda. I haven't revisited Al Sarrontonio's story, but recall it as less goofy than the usual run of his work, if as eager to please. Solid contributions from the rest of the assembled, and a book which really shouldn't be out of print, as with most or perhaps even almost all the entrants in this weekly roundup...and certainly one of the least "Forgotten" of the books I've highlighted. Joe Bob would definitely tell you to buy. Please see Patti Abbott's blog for the rest of this week's titles and links. I have a copy of this. I can't imagine a major publisher today having any interest in RAZORED SADDLES other than as an e-book. It just doesn't fit into today's "business plan." Well, George, note that the original edition was from small press Dark Harvest, even though co-editor LoBrutto had been at Doubleday forever and held some other key positions in the industry. I suspect Avon picked it up for relative peanuts in a What The Hell mood, and at that time thought McCammon was going to be the big selling point. Never seen this one. Some wild and crazy cowboys! Todd - off topic, but I don't know why you can't see the post on mine, just the image. Very odd. I'll edit and re-save, if you want to check back. If still no go, hopefully the rest of the posts and the future ones will be okay. And like the others, I'd not ever heard of this book. I have this too -- though I haven't read all the stories. Having survived many Necon guy-ins, I am not the least bit surprised by Chet's vein of "humour". Really a good book, pity about the closer (and I am genuinely baffled by its warm reception). Even given that Hoffman is writing of Missourians and is herself from the deep South, there are only so many ways one syllable can be slowed down, as opposed to spoken with apparent hesitation or reluctance. 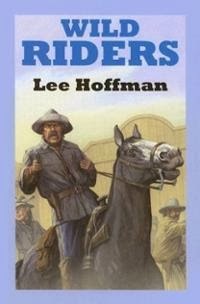 Brade is our protagonist, a former "bushwhacker" in Missouri and more bloodily in Kansas during the Civil War, one of Quantrill's Raiders, who finds himself chafing at the restrictions he and other Secesh veterans and sympathizers are facing in the postwar, somewhat carpetbagged state. Not long after returning to his small farm, only to find the buildings torched and a noose left hanging in further threat from a tree in the yard, Caudell Bradenton finds himself joining up with a small unit of fellow former Confederates to rob banks in hopes of funding some bribery and campaigns to dislodge the anti-Rebel politicians in the state legislature and at least one of their US Senate seats, and more to the point lift the restrictions on anyone who held any Southern sentiments in the past war. He also discovers that his neighbors' daughter, formerly a child he'd watched out for some in his young adulthood, being nearly twenty years older than she, is approaching legal majority and has her mind set on settling with him. 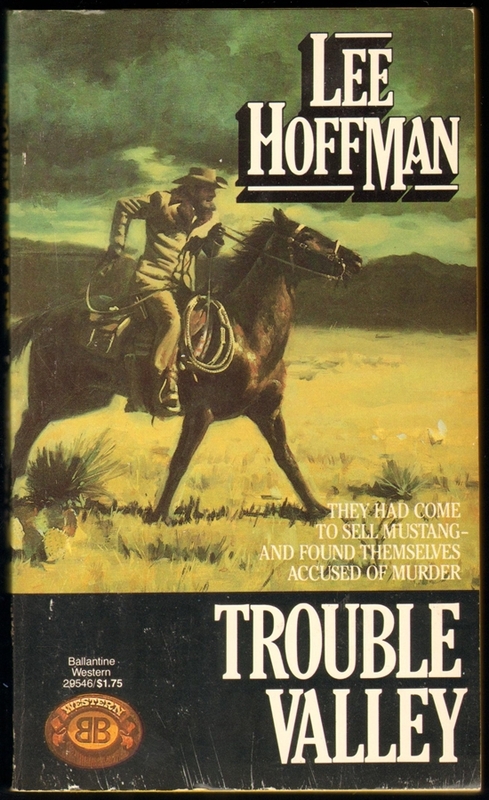 And thus begin his problems, and what turns out to be not only a hardboiled western, somewhat moreso than most of Hoffman's, but also an actual mystery in structure, with questions of purpose and identity held till the closing pages. Also, a formal duel in a western context that might remind one of The Big Country, only with less convenient breakdown of Good Man vs. Bad Man; odd how much of the novel reminded me of, of all things, Ron Scheer's choice ofThe Adventures of Huckleberry Finn for his book this week...some subset of what's dealt with in that landmark is echoed here...though not as profoundly, disappointingly light on the resonance for a Hoffman novel. Though she does slip in no little of her knowledge of the folk music of that era, and even more authentic-reading passages on firearms (and I wonder if the character in the novel named Goforth is a "Tuckerization" of infrequent writer Laura Goforth)...her attention to equine detail also seems more than solid, as Hoffman had famously withdrawn from active fannish/faanish activity in the sf community, at least for a while, by "walking around a horse" and growing very thoroughly involved in equestrian matters (later, she would briefly be on the edge of professionalism in auto racing at about the same time, though not the same place, my parents were, in the early '60s). Great pick. Hoffman wrote some dandy westerns, and it's a shame she's pretty much forgotten. I haven't read any of the SF, but I do have couple. So one of these days, . . . Thanks, Todd, for introducing me to this writer. Hoping I can find one of the titles you mention. I want to review more westerns by women writers, who keep slipping under the radar whether writing a half century ago or today. I have some Lee Hoffman westerns but haven't read them yet. Nice review! I don't know about you, but sometimes I read authors in a jag. I read most of Kurt Vonnegut's then-available novels in a string over a couple of months in the latter 1980s, having read only The Sirens of Titan (his best sf novel), Galapagos, and Cat's Cradle and the essay and short story collections beforehand, and it was time to dig in. That's how I know Bluebeard is the best of his contemporary mimetic novels, althoughRosewater and the near-past historical Mother Nightgive it a run. I read about half of Theodore Sturgeon's collections, before the "Sturgeon Project" complete short-fiction reprints began, in the same way, having read most of the rest of Sturgeon's work sporadically over the previous two decades...and Sturgeon and Vonnegut share more than the mutual paternity of Kilgore Trout...a deep and knowing and rarely naive humanism runs through their work. As it does through the work of Ms. Lee Hoffman, RIP in 2007 and not hardly forgotten herself in several circles, but her books, if Amazon can be trusted, are almost all out of print...there's a pricey large-print edition of WILD RIDERS out, and another title coming soon in a LP edition, and her collection of essays In and Out of Quandry might still be available directly from NESFA Press, some examples of her personal journalism from her groundbreaking 1950s fanzine and elsewhere. But I read the simple majority of her 17 western novels in a jag in 1994, having read her impressive sf short story "Soundless Evening" in Again, Dangerous Visions as a kid, and having known she'd written some other impressive fantastic fiction, but was perhaps best known literarily for her western fiction...her fourth novel to be published, and first hardcover, The Valdez Horses (Doubleday, 1967), had won the Spur Award from the Western Writers of America, and had been (apparently acceptably if unexceptionally) filmed a decade later as a project for Charles Bronson and Jill Ireland. Haven't seen the film, but read the book...in fact, take on all her novels, and note how she starts out as good as anyone could want (she had already been a veteran not only of sf fan publishing, but an assistant editor at her ex Larry Shaw's magazines, and a notable zinester in the folk-music scene), in lighter or darker modes from book to book, but by her mid-1970s novels, of which Trouble Valley is one, she had achieved a practiced grace and a lean manner of slipping in the compassionate detail that helped spoil me for lesser western fiction...the protagonist of this one is not only doing his damnedest to end the conflict with his aggressive neighbors, but to do it as amicably as possible, and Hoffman delivers more tension and less melodrama, more detail to character and realistic description of human interaction than almost anyone else working in the field...this book (and its mates) read like less eccentrically-detailed Joe Lansdale westerns, or Bill Pronzini's without the slightly formal stiffness that can creep into his historical work when he lets it. 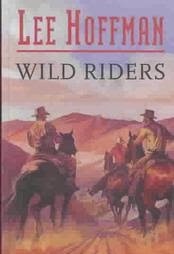 Ed Gorman and Loren Estleman are in her league, too, which gives you some idea...and at least two much better-selling, largely in-print western writers couldn't come close to what she could do. But that shouldn't surprise anyone. As always, thanks to Patti Abbott for sustaining the Friday Books lists. Buy Ed Gorman (and MH Greenberg)'s new volume of best of the year crime fiction to get a sense of what she can do. I have never read a western. Isn't that a crime? My brother made me play cowboys every night of my childhood and I swore off of them. No wait, I read True Grit if that counts. Let's blog about that next week. Top five westerns. So be ready. Thanks, Todd and for all the help. Yep, Charles Portis definitely counts. So do Larry McMurtrey and William Van Tilburg Clark (THE OX BOW INCIDENT and THE TRACK OF THE CAT and the short stories...westerns in THE YALE REVIEW). And Sherman Alexie and Louise Erdrich. And Jorge Luis Borges and his gaucho stories and "The Other Death." And if you haven't read everything Loren Estleman has published, the 'Ganders will git you. 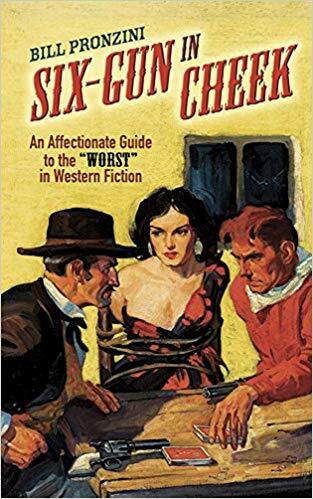 You Gotta tag Bill Crider, Ed Gorman, and James Reasoner at least for a selection of Top 5 Westerns, but I suspect cries of too many potential candidates might redound. Or even McMurtry, though I bet that McMurtrey isn't too shabby, either. I'm pretty sure these stories made their way into the North Atlantic Books series of Sturgeon's complete short stories. Wow. Never heard of Sturgeon's westerns. Very cool. George: Yup. But aside from the two, they didn't appear in the fantasticated collections..."Scars" in E PLURIBUS UNICORN and "Cactus Dance" in ALIENS 4. And STURGEON'S WEST predated the Sturgeon Project books by two decades. Evan: They are very cool, indeed. 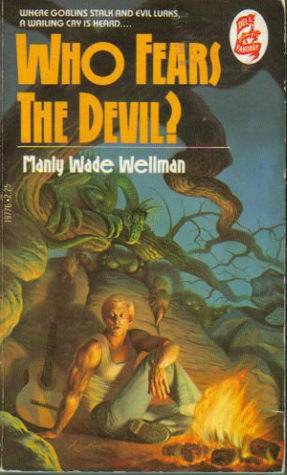 I wish I'd had more time to review and write about them today...it's been a while since I read the book, and it's probably a pity we don't have more sf/fantasy/western crossover, given how similar the forms are, and how good those who are amphibians (Lee Hoffman, Richard Matheson, Bill Pronzini, Joe Lansdale, James Reasoner, Neal Barrett, to name a few off the top) can be. I lucked out in Maine last year and stumbled on a tiny bookstore with tons of Zane Grey western magazines. Sturgeon has been a long favorite but like Evan was unaware of the westerns. 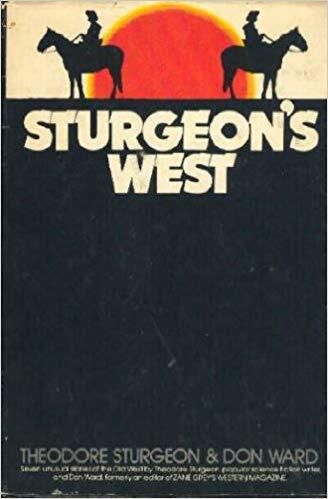 I'll have to admit that I, too, had no idea that Sturgeon wrote Westerns. We've adapted so completely to the niching of our lives (and writing). Sigh. Cross genres at your own risk. It's all about the "branding"! That Sturgeon guy would ha' learned that if he lived now. Thank goodness he didn't. Kate: In the '40s and '50s, it was more like, cross categories if you like to eat...because while there were enough sf magazines, for example, briefly in the '50s to keep someone afloat, that was a very brief period indeed. Meanwhile, today, the major villains in hostility toward diverse writers are the chain bookstores, who are quite certain that no one wants to read someone's contemporary mimetic novel if they are primarily known for romance, until it's proved beyond the shadow of a doubt that readers do (as they usually do). Publishers and such cater to them...this quite aside from the delightful practice of Ordering to the Net, so that the stores/chains only order the same amount of the new book as they sold (not ordered) of the last one. David: I don't like Grey's fiction much, but at least the later issues did away with it, and the early ones tended to abridge it...but the new stories in a given issue do tend to be rather good. Just got back from a dude ranch vacation in southern Colorado where I came across this book in the lodge library. Being a long-ago fan of TS I picked it up to read in our cabin. Wonderful stories with some of the typical Sturgeon touches (repressed homosexuality; fantastical, almost magical realism descriptions, etc) as well as idiosycratic western dialogue conventions ("I cain't"). Didn't quite finish the book, and was sorely tempted to steal the book when I left but didn't. Found this site while googling, looking for a copy. Truly a forgotten gem. This is the most recent book I've covered in the Patti Abbott-driven "Forgotten Books" series of capsule reviews/recommendations, but it's already out of print (at least in the original edition...the Large Print edition, which has the handsomer cover I've posted here, is available)...Five Star, a division of Gale, aims its products at public libraries, though aficionados of crime fiction particularly have been known to pick up their releases (and they do have available another volume, a mixed collection led off by a collaborative novella, of western fiction from Muller and her husband, Bill Pronzini, Crucifixion River). 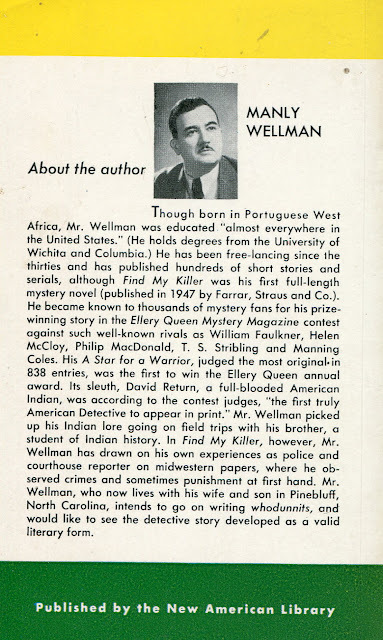 Muller began writing western fiction in large part out of enouragement from Pronzini, back in their pre-married days, as Muller notes in her introduction; several of the earlier stories appeared in anthologies edited or co-edited by Pronzini, who has been publishing his own western fiction since the late '60s, and one of the stories in this volume, "Cave of Ice," was their first attempt at a collaborative story. The title story was loosely adapted for an anthology telefilm,Into the Wild, albeit Muller wasn't too impressed with the result. 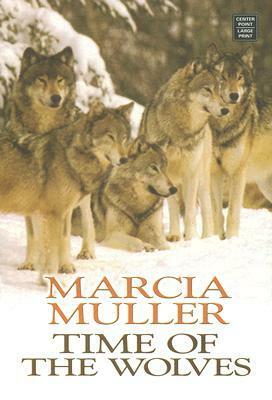 The jacket copy misleads us, stating that "Time of the Wolves" won, rather than (as Muller notes) was shortlisted, for the Western Writers of America Spur Award for best short fiction for its year. The stories are arranged in chronological order of publication, earliest first, and thus one gets to see Muller get more comfortable with period language in the non-contemporary westerns (the stories very nearly alternate between contemporary western fiction, including a story in her Elena Oliverez series and two in her most widely-read sequence featuring private detective Sharon McCone, which nonetheless has some plot-element or other connection to the frontier west, and historical western fiction set in frontier times)...one of Muller's greatest strengths is her lean, almost transparent prose that also maintains a sort of tension of immediacy at its frequent best, particularly in the McCone stories, a style which is slightly cramped in the earliest historicals, but by "Sisters," a 1989 effort involving two women alienated from their respective Caucasian and Native communities who strike up a cautious friendship, her comfort with the dialect and period references is surer. (I like "Sisters" better than "Time of the Wolves," but the slightly older story is one of those narratives where shitstorm believably follows catastrophe, and I can see why both the Spur judges and the tv movie folks were attracted to it.) The last two stories in the book are set in the same fictional county, in frontier times, as the contemporary novel Point Deception, a nice bit of business (the novel has been on my To Be Read pile for a few months now). As a Detroit native (hi, Patti!) who migrated as a young adult to the SF Bay Area and remained settled there since (hello, again, Patti...whose passage was from Philadelphia to the Motor City area), Muller is one of the best writers about the Bay Area geist and California region we have...she hasn't, for me, yet exceeded the excellence of the first McCone novel I read, 1989's Trophies and Dead Things, but she's nearly equalled it several times since, and no one reading Time of the Wolves is likely to be wishing to read something else instead. One other oddity about the Five Star edition is that Ramona Watson's Plantin typography is utterly lacking in italics, leaving some titles in the text in all caps, and other passages in bold, though only the latter looks antiprofessional. Perhaps Plantin lacks italics for some reason (and good on Five Star for crediting the typographer). I've been reading Bill Pronzini's work for nearly all my literate life, but haven't met him yet...I have met Muller, sadly not under the best of circumstances. I used to work in a Borders Book Shop, for the latter half of my stint as the office manager (which at a Borders at that time meant Payroll Manager, Primary Store Accountant, and Last in Line in the Management Hierarchy if a bookseller or barista was being hassled or other momentous authority figuring was required), and our Borders had for most of my time a public events coordinator who just couldn't seem to get the local press nor customers interested in much of anything...this was in the DC suburbs, so US Rep. Barney Frank drew a good crowd, and the combined power of her several audiences meant that a Madeliene L'Engle event, not long before her death, was a blowout, but an appearance at our store by Marcia Muller, scheduled for an late weekday afternoon no less (as I remember it), was not well-conceived. In fact, even I wasn't aware she was coming till an hour beforehand, and when I expressed interest in the prospect, the coordinator asked me if I would introduce her. What I should've realized, but didn't, was that I would also be a large proportion of the audience for her in the store, which eventually numbered as much as five or seven. She was, as one might gather, not pleased, and cut her appearance to a brief Q&A, where it became clear that I was the only person in the six to eight who knew who she was, and the others had decided to sit down out of mild curiosity. (Floyd Kemske, then publishing Aboriginal Science Fiction and writing suspense novels, had a similar experience in our store a few months earlier, which he wrote up for his column in that magazine...Kemske didn't even have the meager benefit of my presence, and since I wouldn't've recognized his name at that point only from Abo, where he chose for no really good reason to refer to himself solely and officially as "A Crazy Alien," a ploy unmatched among professional fiction magazines in its editorial childish cuteness since the early 1940s letter column in Thrilling Wonder Stories conducted by Sarge Saturn and his companion WartEars...actually, Sarge still comes out ahead [Kemske previously had been the editor of an abortive attempt to continue publishing the once-seminalGalaxy magazine, and perhaps feared prejudice on that score]). A pity, since I've continued to be a big fan of Muller's work. I just don't understand the finances of books going out of print in six years. And I've been at author events like that-very awkward, isn't it? I walked by one in NY once where there was no one at all and the poor guy had 20 chairs set up in front of him and twice as many books. Or less. I believe Five Star feels particularly the pressure of the taxes on inventory that were introduced ca. 1980, and have made publishers very antsy about keeping their midlist in print since...since Five Star is apparently mostly about the several-thousand-copy library sale. It is both blessing and curse that westerns are so popular with the large print audience...curse only in that this implies that the audience is aging heavily. Imagine how awkward if your are the only visible representative of the store that has so obviously wasted the traveling writer's time. I have attended quite a few book signings and have at the worst been among a group of about fifteen but that was for an unknown author and a self published book. I'm a fan of Marcia Muller's work and would have been devastated in your shoes. I worked in DC from 1998-2004 and as you can imagine hung out at a lot of the Borders stores. Can you mention which one? The now relocated Vienna, VA store (the newer store is closer in on Rt. 7). Ok, I hung out more in the Bailey's Crossroads area. Yes, if you were at the Borders near Bailey's XRoads, that was where "my" Borders moved to ca. 1997. Can anyone explain to me why readings tend to be so badly attended at cons? I love giving readings, but I stopped after the last bad experience. It's not just me, LOL. If you're a really big name, people show, but they can't be bothered for anyone else. Too many competing tracks of programming, too many people uninterested in the fiction these days, too much potential drunken fun elsewhere, too much a matter of Who are you exactly?, too many bad public readers. But probably the last two not as much. Bill Pronzini had assembled both Gun in Cheek (1982) and Son of Gun in Cheek (1987; perhaps sadly not Gun in the Other Cheek, which might be accused of echoing Ellison or the Secret Policemen) out of his fond memories of some of the worst in crime fiction, picking through his extraordinary personal library and beyond, and Mysterious Press published those, perhaps with not the greatest sales among his bibliography but I doubt they actually lost money for anyone...but there wasn't as much publisher interest in a companion devoted to the similar worst of western fiction till Steve Stillwell and Bruce Taylor convinced him to do it for their Crossover Press in 1997, publishing a limited edition with minimal distribution...I have copies because Pronzini was willing to offer copies for sale from his own stash, and might still; interested parties should drop him an email at pronhack@comcast.net. It's a pity that this book has been so obscure from jump, as it's more relaxed than its companions, and draws on at least as broad a swath of bad pulp, lending-library, paperback, and other sources over the last century...and so as with the other volumes, you get a good sense of a lot of the less ambitious, I think it's usually fair to say, realms of publishing (and perhaps a bit saddening where not fair, as older writers faded and newer ones took on more than they could handle, all put on public display when they really shouldn't've). Pronzini doesn't spare himself, either, in describing at reasonable length one of his least-proud moments, a collaboration with Jeffrey Wallmann on one of the lead novellas published in the revived late '60s/early '70s Zane Grey Western Magazine, under the byline of Grey's son, Romer Zane Grey, as they all were for no compelling reason (at least the ghosted Mike Shayne novelets in stablemate Mike Shayne Mystery Magazine were all attributed to the Davis Dresser pseudonym put to the original novels in the sequence, "Brett Halliday"). And Pronzini isn't the only good western writer tagged here for sins, or at least what Pronzini enjoys dubbing Alternative writing. Sadly, I can't find again, among the many examples of Overly Colorful abuse of antiquated and utterly fabricated language attributed to various stalwart and blackhearted characters, the most ridiculous villain's name...I'll add it to the post when I locate it again. Pronzini notes, not incorrectly, that the western is an American artform, much as hardboiled crime-fiction was pretty much born in the US...but hardly the only art born here and not the only one to also find excellent practitioners abroad (Jorge Luis Borges alone, with his stories of Argentine ranchfolk and their colleagues, would be enough of an argument against US exceptionalism). Musically, jazz, blues, bluegrass and rock music took shape in the States, as well, among other forms, and when British bands could show, particularly in the 1960s, a facility for similar work, sometimes Well-Meaning folks such as record producer Joe Boyd tried to steer them away from exploring American music too thoroughly...so a lot of the songs, collected from late '60s recording sessions for BBC Radio shows for the various forms of Heyday over the last couple of decades, were never given full studio recording by Fairport Convention, the most important and longlived of the UK's folk-rock bands, in most ways the correspondent to the American Byrds. Boyd takes the blame for that in his liner notes, at least in part (and he calls such Canadian composer-performers as Joni Mitchell and Leonard Cohen American, but perhaps they had emigrated at the time). The grumpy young bandmembers (see photo above), already having faced tragedy (several members of the original lineup were killed or injured in a traffic accident before these recordings, after their eponymous first album) and weren't yet quit of it (their second female vocalist, Sandy Denny [above], would die in a fall down a stairwell shortly after leaving the band to form her own, Fotheringay), but they could (write and) record a jokey "If It Feels Good, You Know It Can't Be Wrong" as elegantly as they could a bitter "Reno, Nevada" (a composition by the doomed Yank Richard Fariña), an awestruck original "Shattering Live Experience" as deftly as the similarly besotted Cohen love song "Suzanne"...and such songs of uncertain and lost love as Mitchell's "I Don't Know Where I Stand" and ex-Byrd Gene Clark's "Tried So Hard." The latter-day expanded editions are simply an even better reason to seek this out. 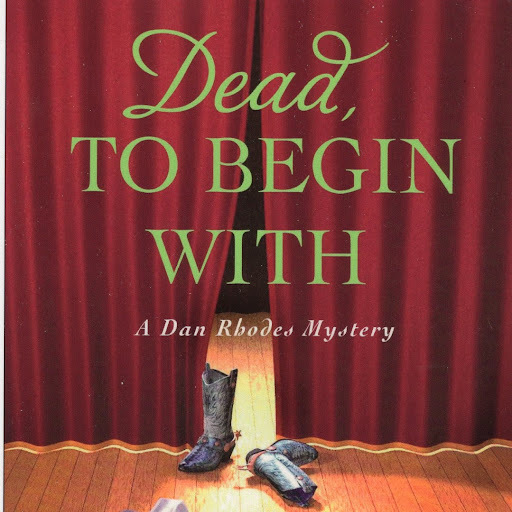 For more "forgotten" books this week, please see Patti Abbott's blog. Six-Gun in Cheek is hilarious. I need to pull out my copy for a refresher. I like GUN IN CHEEK just a little better than SIX-GUN IN CHEEK. But both books are classics. A nice overview, Todd. 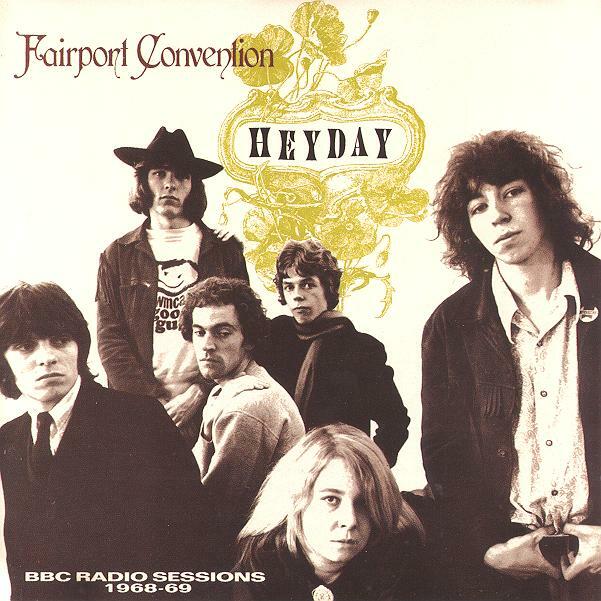 And I do remember that Fairport Convention. Well, George, as I say, SIXGUN is more relaxed...there's a slightly rushed feel about GUN that I like less well. And I like them all. Yes, Patti, Fairport never fully recovered from losing Richard Thompson after the album FULL HOUSE, even if the band that continued went on to make very pleasant music, and reunited with surviving ex-Conventioneers at various one-off occasions (as the online videos will demonstrate). The loose agglomeration album THE BUNCH, from about the time Denny was leaving FC, is also quite worthwhile, not least as the first time, iirc, Richard and the soon to be Linda Thompson recorded together. I don't agree with many who insist that the earlier Judy Dyble (and Martin Lamble) version of Fairport was simply a British clone of the Byrds and Bay Area bands, despite drawing on similar sources (and Thompson's love of jazz guitar licks)...not Too many autoharpists among Moby Grape and Spirit, at least that I recall. Some quick takes this week, but nonetheless some important books, the first one at least to me. 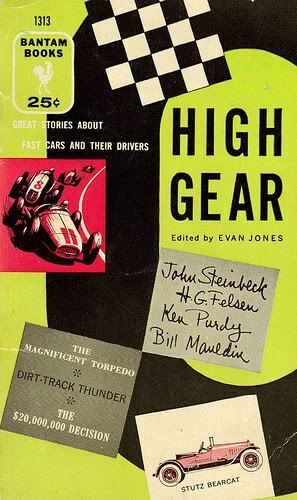 High Gear was the first anthology of sports fiction I read, as a kid; my father was a (mostly) amateur auto-racing driver (mostly sports cars, both track and auto-cross racing--the latter long-term road-racing, sometimes with my mother as navigator) in Alaska in the early and mid 1960s, and the Bantam Pathfinder edition of this anthology presumably caught his eye at the racks or someone else's eye who thought it would be a good gift. Certainly it was to me...it was my first encounter with the fiction of William Campbell Gault, William F. Nolan, John D. MacDonald, William Saroyan (beating out first exposure toMy Name is Aram by a year or two), war-correspondent legend Bill Mauldin and some guy named Steinbeck; it wasn't my first experience with Thurber, but close, as well as with such sports-fiction specialists (along with Gault) as Ken Purdy and Henry Gregor Felsen. I don't know anything about this Evan Jones (there seem to be, possibly, several active in the literary world in the last century) except that he also seems to have edited some western and otherwise frontier-oriented anthologies...and that he had excellent taste as an editor here. High Gear ed. Evan Jones (Bantam Pathfinder EP32, Jul ’63, 45¢, 184pp, pb); Reissue (original: Bantam, Mar ’55). What's notable to me in this anthology, with its stories chosen by polling the members of the Western Writers of America, with a simplified Australian ballot (essentially, please name your choice for best western short story ever, and your four or so [more if you like] other suggestions for the anthology) is in who isn't in the book...such younger writers as Joe Lansdale and Loren Estleman were still establishing themselves in 1983-84, but the absence of the Els--Elmer Kelton and Elmore Leonard--seems a bit odd, though perhaps their stars have risen among their peers in the last quarter-century. 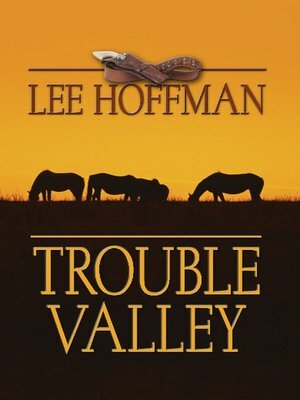 (Old favorite of mine Shirley/Lee Hoffman barely wrote any short fiction in the western field, pretty much going straight into the novels with The Valdez Horses and her first-novel Spur; rather comparable to Samuel Delany's entry into the sf scene.) Also, and even more surprising to me, is that not a damned one of these stories was first published in a western-fiction magazine, pulp, digest or otherwise, though the "Clay Fisher" story was apparently first published in the "1962 Doubleday WWA anthology," as the Spur Awards page on the WWA site puts it (not bothering to name the anthology!--though Pronzini and Greenberg fail to do so, as well, in the copyrights detail page). I've just received this book, so haven't yet had the opportunity to go through it...though it does look inviting, save the Zane Grey story (which, I'm amused to note, was first published in The Ladies Home Journal...given the machismic anxiety of some western readers, I'm sure that datum wouldn't help, but of course Grey, in the manner of Stephen King, wrote badly enough on a regular basis to transcend the usual audiences for his kind of fiction at the time...and perhaps, as I occasionally am with King, I'll be pleasantly surprised by this novella). The Mystery Hall of Fame. 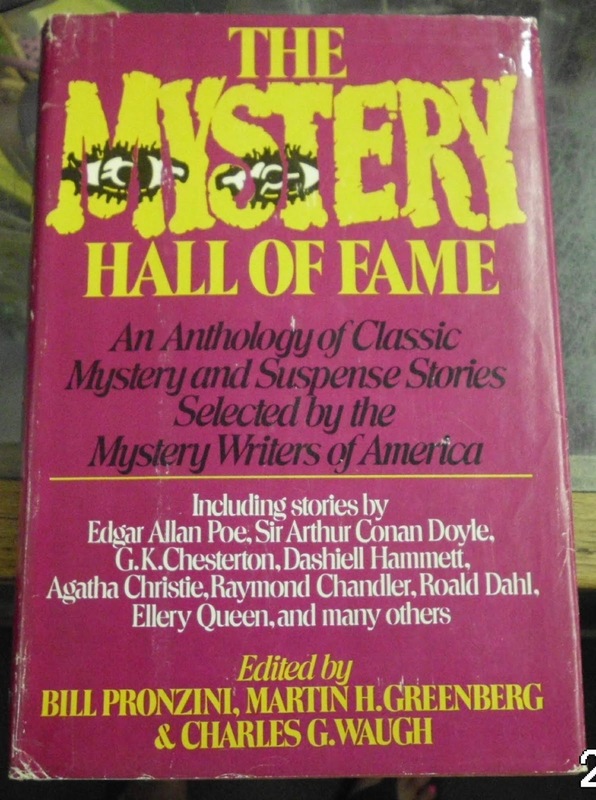 edited by Bill Pronzini; Martin Harry Greenberg; Charles Waugh; from polling of the Mystery Writers of America. 467 pp. ; 22 cm. Sweet fever / Bill Pronzini. Now, this selection seems less surprising, though to find Kemelman muscling past the likes of Ross Macdonald, or John D. McD for that matter, seems not so much a gross injustice as a product of the time of the polling. 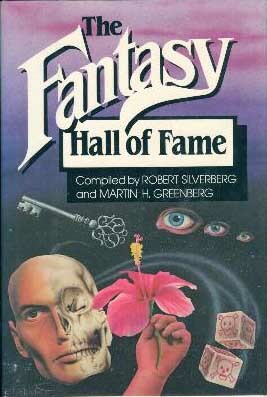 However, as wonderful a story as W. W. Jacobs's "The Monkey's Paw" is, it has essentially no business being in this book...as opposed to the Silverberg and Greenberg The Horror Hall of Fame. The Pronzini was polled in, and published here over Pronzini's objection (a jusst case of modesty overruled). There is perhaps one too many classic stories here of murder and eating the evidence, but the gimmick was pretty irresistible, and the stories are indeed classics (though John Collier's "A Touch of Nutmeg Makes It" might still be the most insidious of this class among the early stars). (Also notable to me is the number of typos in some WorldCat listings...fixed above...) Another recent purchase (simultaneous, actually), but I've read more of the selections above before, and don't actively dislike the work of any of the writers collected here, so expect to have a more familiar good time going through this one. 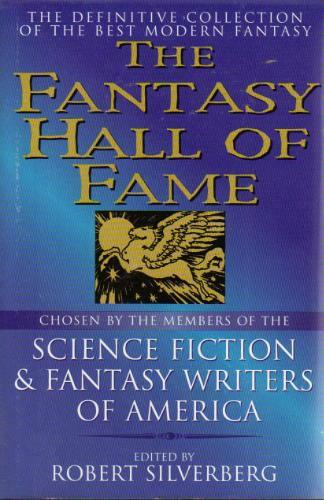 The Fantasy Hall of Fame ed. 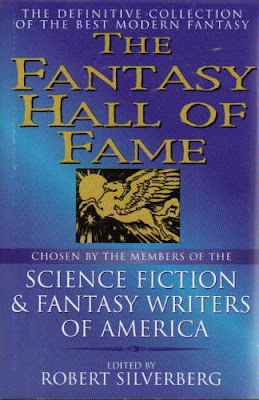 Robert Silverberg (HarperPrism 0-06-105215-9, Mar ’98 [Feb ’98], $14.00, 562pp, tp) Anthology of 30 fantasy stories from 1939 to 1990, chosen by SFWA members. Introduction by Silverberg; individual story introductions by Martin H. Greenberg. 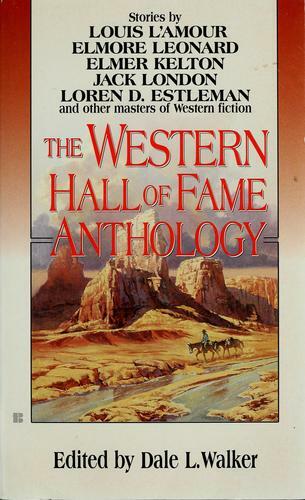 Reading about The Western Hall of Fame reminded me that when I was a teenager and even later, I read westerns very enthusiastically. I remember Zane Grey and Walter van Tilburg Clark, though I don't remember the actual stories. Just that I read and enjoyed them. I also read O Henry - mostly in school, but do remember one particular story of his. Not a western. By the way where is Louis L'Amour's name? 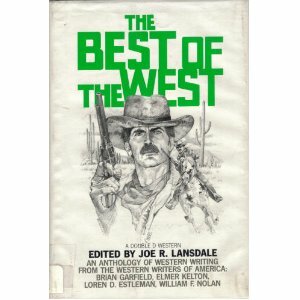 I have an anthology of Elmore Leonard's Western Novels which I've been meaning to read. It's here, on the TBR pile. I was wondering if MY ANTONIA or RAMONA might be considered western novels...What do you think Todd? Well, Clark was a vastly better writer than Grey, and you might remember THE OX-BOW INCIDENT or THE TRACK OF THE CAT or "The Portable Phonograph" from Clark, or RIDERS OF THE PURPLE WAGE from Gray (ZANE GREY'S WESTERN MAGAZINE, aside from the Grey reprints!, was one of the best western fiction magazines we've had, a Dell digest in the latter '40s and '50s, briefly revived by Leo Margulies in the early '70s but despite early work by Pronzini and others, that version was less impressive). Louis L'Amour wasn't as invested in short fiction as he was in novels, but if one's going to include Grey...I suspect Grey had a stronger nostalgic hold on the voters' memories. 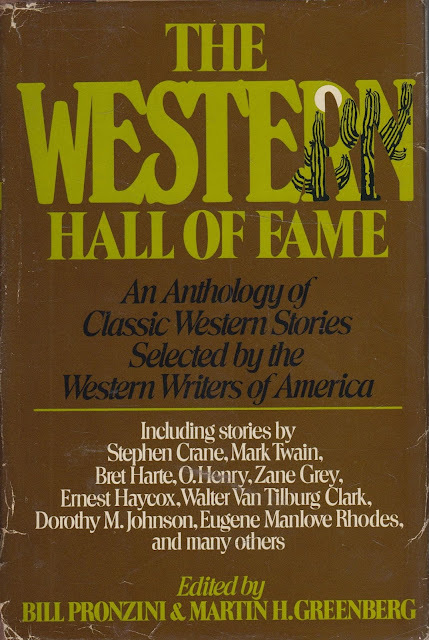 "Luke Short," Steve Frazee, there's a whole lot of folks who were not included who might well've been...and that might've been just one reason Pronzini produced a pulp western companion volume (even Damon Knight edited a collection of pulp western fiction in the '70s). If you have that collection of Leonard's short fiction that was published so handsomely about seven years ago, you probably won't be disappointed. Don't know why I want to call him "Gray," but I do. The title and those High Gear covers look familiar so I may have to go digging in the garage as long as it doesn't snow. I've never been a racing fan, but that hasn't stopped me from adding books of this type to my sports fiction collection. I know what you mean. I'm usually lukewarm at best to most sports, but I'm usually game for sports fiction...I like fiction. 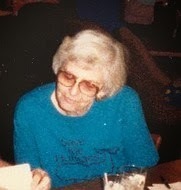 Not surprised to see Dorothy M. Johnson with two stories in that first Western Hall of Fame. What a fine writer, one of my favorites no matter the genre. She grew up in Montana, worked for a time in New York City but returned for many happy years. Loved her memoir of her frontier childhood in Whitefish, Montana WHEN YOU AND I WERE YOUNG WHITEFISH. 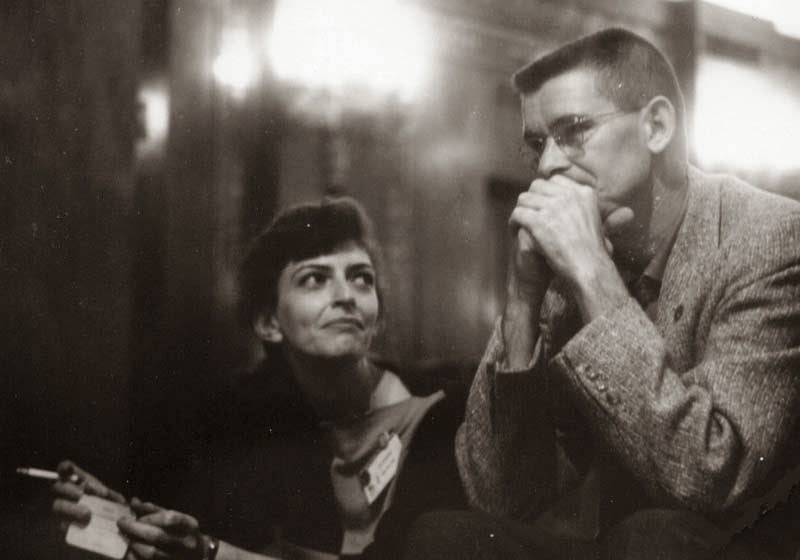 After an early failed marriage, she was proud of her self-sufficiency both from writing and jobs such as the director/manager of the Montana Press Association. 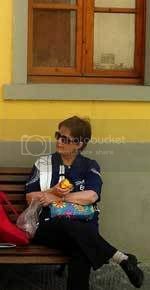 I read that her epitaph on her tombstone in Whitefish is one word "Paid." And it's remarkable that she wasn't included in the second volume...Peggy Simpson Curry being the sole woman writer there. 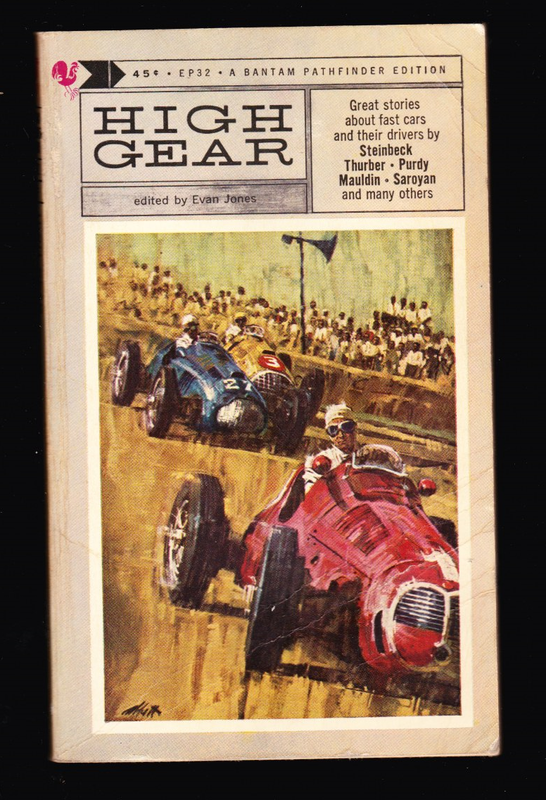 Sounds like an interesting anthology, the car-racing one. I've been tempted to try to compile a sports story anthology in Finnish, but I'm not sure whether there enough old stories to fill a book and enough younger writers to try theirs hands at writing sports stories. If you don't feel like translation...though do you think there are no handy writers with a passion for any given sports? Even with my general nonchalance, I've written a scrap of sports fiction, and could easily write some more (classic women's volleyball, not so much the competitive beach variety, is certainly inspirational, if not necessarily of story ideas). Would like more Lady Gaga content! Need more lady gaga content! Patience, dearie. A smidgen of Stefani Germanotta content is likely soon. John was not the first series character of his sort Wellman wrote about...to Weird Tales (and its short-lived competitor Strange Stories), Wellman had contributed fiction about the not too dissimilar Judge Pursuivant and John Thunstone, and when Wellman toward the end of his career began writing short novels about John the Balladeer (five were published), he also wrote two about Thunstone. But it was John, who began his adventures in the pages of the then-new The Magazine of Fantasy and Science Fiction(after two sort-of proto-John stories for Weird Tales, which the "Planet Stories" edition includes), wherein Wellman was most elegantly able to bring together his passion for history, folklore (and particularly that dealing with the supernatural), music and the culture of his adopted homeland of North Carolina (albeit he was a fixture of Chapel Hill, not, on balance, the most Appalachian of NC cities). I haven't read all his work (I particularly look forward to some of his folklore-collection and historical nonfiction), but these are masterpieces among his contributions, which also included further fantasy (folkloric and otherwise), historical fiction (western and otherwise) and science fiction. As demonstrated here, there have been a number of editions of this volume (many augmented by the addition of later or earlier stories or related matter), after its initial publication by Arkham House in 1963. The first paperback, Ballantine's, ludicrously plasters "science fiction" across the cover, in the hope in those days before the consistent popularity of Tolkien and Stephen King that some readers might take a flier on a collection of horror and dark fantasy stories. That's the first edition I picked up, as well, in the late '70s, since even though the amateurish if well-intentioned filmWho Fears the Devil? 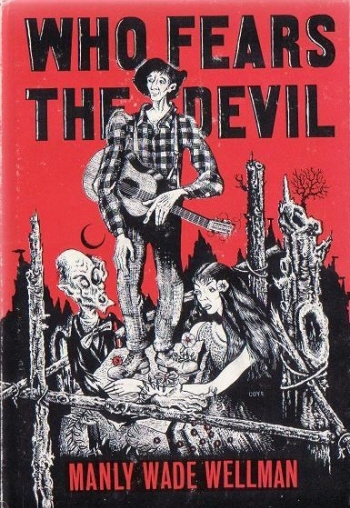 (aka The Legend of Hillbilly John) had been (barely) released in the early '70s, the book had not yet been given the relatively consistent in-print status it has achieved since. 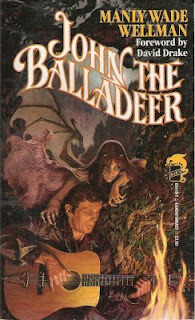 The shortlived Dell Fantasy line got it out not too long after I picked up my copy, and Karl Edward Wagner, who became a great friend and editor/publisher of Wellman, wrote the introduction to the first "augmented" edition (newer stories added), from Baen Books, John the Balladeer. 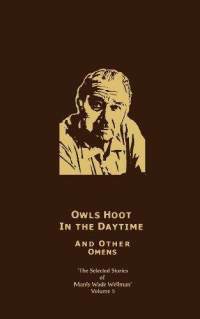 Owls Hoot in the Daytime and Other Omens (Night Shade, 2003) was the final book in John Pelan's five-volume selected short fiction set of Wellman's work, published after his death and furthering what Wagner and his fellow Wellman acolyte David Drake had done with their 1973 Carcosa House omnibus of Wellman short fiction,Worse Things Waiting and, in 1981, Carcosa following that with Lonely Vigils, which collected stories of Pursuivant, Thunstone and one about another such explorer, Nathan Enderby. Owls is the volume devoted to the stories of John, and includes Karl Wagner's introduction and an afterword by Wagner's predecessor as editor ofThe Year's Best Horror Stories, Gerald W. Page. I really love the Silver John stories. They're among my favorite fantasies. They are brilliant, at their frequent best, and good fun at their infrequent worst. Wellman was able to shake off any self-imposed limitations (occasionally evident in, say, the Thunstone stories) when he turned to John. They are some of my favorite fantasy stories of all time. Haunting and original and just plain nifty. You might be surprised how much resistance I've found in encouraging folks interested in folklore, very much including that of the Appalachians, in taking up this book. Thanks for posting your photo, btw. I have the third Who Fears The Devil? and the John The Balladeer books as well as the Nightshade volume. I'm likely one of the two previous posters you mentioned. I was pretty sure you were, Randy, but didn't take the time to check. Harried weeks. I have had all of these except the Arkham House hardcover (and hope springs eternal even there) and may still have even the Dell edition with the Rowena Morrill cover and that (aptly labeled) ghastly British paperback. The John the Balladeer stories are something I would require in any "one hundred books to have on a deserted island" list; I never tire of re-reading them. And yet I still need to read the last two novels. Life is like that. I've had this one on the shelves for ever it seems (well, it's a fairly unimpressive 1975 UK edition from the the 'Star Books' imprint - you can see the cover here: http://bit.ly/ViHFZ1) but have never read it - clearly time to - thanks as always Todd. Yeah, I posted a link to that inept cover in my text, as well, Sergio. Don't let that deter you at all. And thank you.